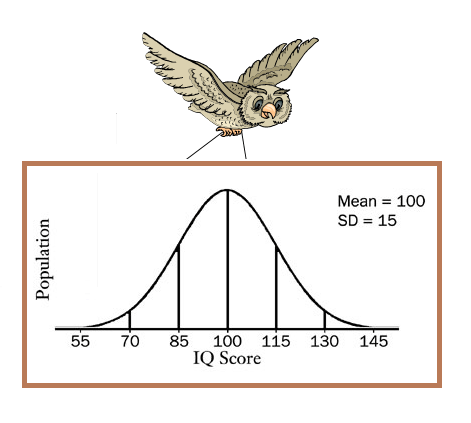 The Psych Owl ogist said that he had chosen to use the Ravens test because it was suitable for young Tweetlets and a good test of visual spatial ability which is very important for Twitter birds. He said that the Tweetlets had scored very highly indeed and added that, to give a complete picture and a more accurate score, a full battery of other tests could be done in future if required. He showed Tweet and Retweet a diagram of the Bell Curve of IQ scores in the population and showed them how the higher the IQ was the smaller the percentage of the population it represented. He cautioned that this could make it difficult for Tweetil and Tweetelle to fit in when they started FLOCK Ed as they may not find others who would understand them. He said it was very likely that they would choose older Tweetlets and adult Twitter birds for their friends. “It is very important for them to find true peers who can be true friends and share thoughts and experiences with them at the depth they will seek” he said. He also warned that they could be very disappointed with the introductory years of FLOCK Ed as they would be covering topics which they already understood. “In most introductory classes they are still learning the nesty rhymes,” he told them. 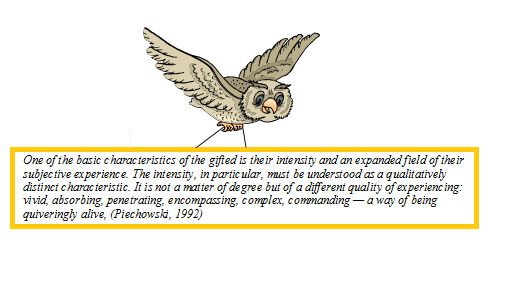 “In fact,” the Psych owl ogist continued “it may not be wise to send them to the local flock. You need to select a flock which will allow them to go far! 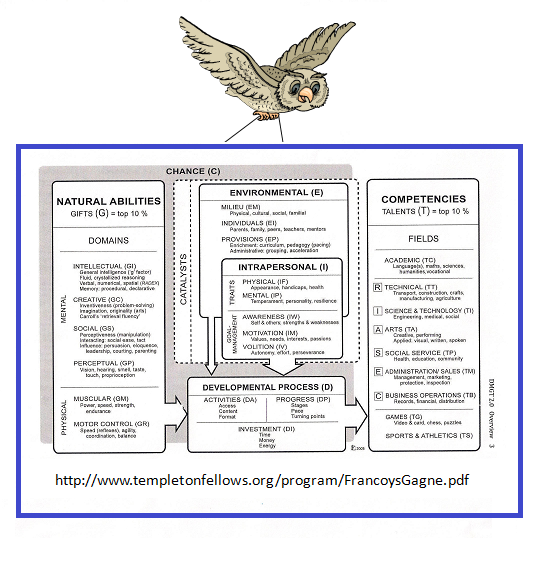 At this point the Psych Owl ogist produced a diagram of Professor Francoys Gagne’s DMGT model and pointed to the Environmental Catalysts section to demonstrate how the influence of the nest environment played its part in the development of the Tweetlets innate giftedness into fully developed talent. The Psych Owl ogist drew himself up to his full height and fluffed out his feathers. “Good heavens, no!” he said “Talent development is very important but it is only one part of the story. 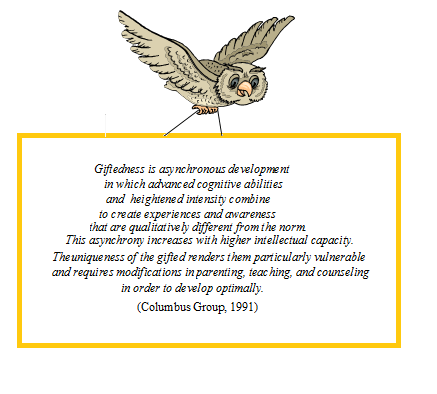 Giftedness is not only about what the IQ score is and what achievements are made. 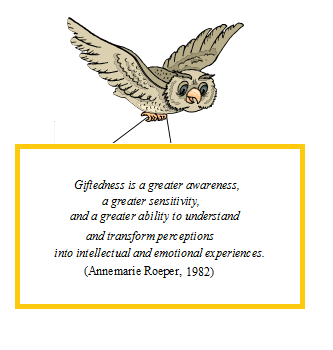 The Psych Owl ogist produced a series of giftedness definition flashcards. This entry was posted in Uncategorized and tagged assessment, asynchronous development, Bell curve, Columbus group, Dr Annemarie Roeper, Dr Linda Silverman, friendships, Gagne DMGT model, giftedness, Michael Piechowski, Miraca Gross, psych owl ogist, Tweet family, twitter birds by jofreitag. Bookmark the permalink.